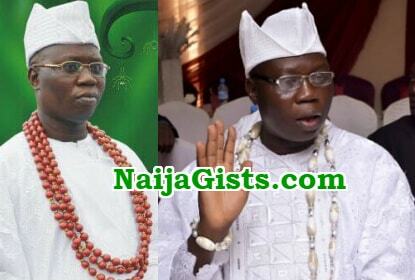 OPC boss Gani Adams, the 15th Aare Ona Kakanfo-designate of Yorubaland, today dismissed superstitious belief that taking the title may lead to his early death. Adams, the National Coordinator of the Oodua Peoples’ Congress (OPC), told newsmen in Lagos that not all those who held the position in the past had died young as is being speculated. Adams will become the 15th Aare Ona Kankanfo of Yorubaland, when installed. “Let me say that death belongs to God. Only God can decide and determine when anyone can die and until God decides, I will not die young as the defender of my people. “Aare title is highly spiritual and I have handed over my destiny and tenure to God. “The position in the past meant that you have to continually fight wars to protect your people, and may be killed in the process, but that was before Nigeria became a sovereign nation. “The job in the modern era is limited in terms of physical defense because there are security apparatus to settle disputes. “However, it has become a position to unify the Yoruba race, defend their interest and believe in their cause, “ Adams said. The 47 year-old leader of the OPC also put to rest speculations that he would dump the group following his new status, saying he would continue to oversee its activities. “The OPC is my sweat. I will delegate some powers to some members to continue to run it while I oversee it. “The OPC gave birth to the Oodua Progressive Union which I have established in 78 countries to cater for the interest of Yoruba people in Diaspora. “I will continue to have a stake not only in the OPC, but in all groups in Yorubaland.